Punchy & lively sounding great purchase. Ridiculously large & heavy but well worth it. I have a large Home Theater setup with a Mitsubishi big screen in the center. I have this center speaker perched atop the TV. This speaker sounds very nice. The dialogue that comes out of this speakers seems so accurate and real. I can't give this speaker enough compliments. No complaints whatsoever. This center speaker sounds great. I have heard many in my time, and I can honestly say that I have not heard a better speaker. Polk has hit a home run on this one. Good looking too. It is quite large though. Many many speakers. too many to list. I really like this speaker. It matches perfectly with my pair of rt1000i. I have had many compliments on my setup, which includes the rt1000i as the fronts, the cs400 center, and rt55i's in the rear. Talk about perfect tonality and seamless movie experience. Couldn't be more satisfied. I moved up to this unit (CS400) from a Paradigm model CC150, and there is NO comparison! 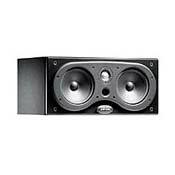 This is the clearest sound I have ever heard from a center channel speaker. I have demo'd about every speaker line I could in the $500 range and this is it! My father-in-law is a little hard hearing, mostly when a group of people are talking in a casual setting. To make a long story short, we watched Titanic last night and his exact words were, " I can hear everything they are saying, including the parting of thier lips!" Folks, that says everything. BUY this unit. It is incredible! i have only had this speaker for one short week but was very impressed with the way it made sound seem like it was coming from everywhere and yet nowhere. it has excellent bass handling and along with my polk rta 12,s and yamaha powered sub it really had my listening room rumbling. was undecided when i ordered it between the cs 300 and the cs 245. any of the three would probably have sufficed but the possibility of future upgrades to newer high end polks made the cs 400 the most suitable selection. i am very satisfied after getting over the guilt of spending 130 dollars more on the top choice than accepting the lowly but acceptable cs 245.
advent- tiny affordable center purchased at the start of my home theatre interest. Excellent build. Very solid, tight construction. Good sound in both music and DVD. I did quite a bit of research on this site before settling on this speaker. I went to Circuit City and listened to the CS245, which was what I had been considering. After comparing the 245 and 400, I bought the 400. I've been very happy with it. I'm going to try bi-wiring it today, since it has that feature. The instructions say nothing about being able to do this or how to do this, but I've read other places that it really makes a difference. This speaker is quite loud and I've had to adjust it to match my 14 year old Cerwin Vegas that I'm using for front. I have Polk RT35's for rear and a Velodyne CT100 sub-woofer. All in all, I am very pleased with Polk and this speaker in particular. This speaking is big and heavy, not made to sit on small TV's and entertainment systems. The wife factor is a consideration in your purchase. I have always been a closet audio enthusiast and a devoted Polk fan, I have Bookshelf/Monitor speakers that I still use and enjoy after 13 years of use. My old center always sounded "twangy" and in a cone. So this speaker is a step in the right direction from the moment I installed it. I now hear effects that were lacking from my previous speaker. A fine example is from the DVD "Top Gun," I'm hearing the gears, cable hook ups, steam of the catapults on the aircraft carrier as the crew hook up the aircraft in the opening scenes of the movie. I bought it on-line from Crutchfield for $279.99 plus shipping, this is the best money I've spent since buying my DVD player. Now I have to save up for better surrounds, maybe the f/x 500's.